On this page we will try to explain how to resolve problems when viewing the Malayalam pages on web browsers like firefox and google chrome. School Wiki uses Unicode to encode its pages. 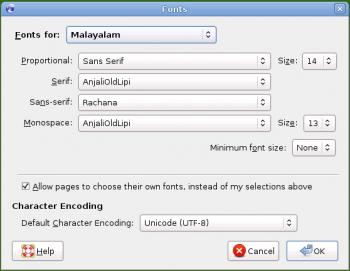 If you do not see Malayalam letters at all you may need a Malayalam Unicode Font, sections below explain the best options for various platforms. If you see Malayalam letters but there are too many spelling mistakes your browser is probably not set up for Indic scripts. There are 2 parts of the setup. Since Unicode has gained popularity recently, If you use old browsers they might not have the capability to understand Unicode and hence they might display garbage. The developement in the Indic scene is so fast nowadays that its common to see drastic improvements between browser versions released just a couple of months apart. So you are better off getting the latest version of your web browser. The capabilities and version of your operating system might also come into play here. Mozilla/Firefox: Mozilla, Firefox and other Mozilla derived browsers have 2 options for font rendering. Their own renderer and pango. Pango is a better choice for redering Indic scripts but its disabled by default because pango makes the browser slightly slower. To compile Mozilla with pango enabled you have to configure with --enable-pango option. Konqueror: Konqueror is the native browser of KDE environment and I have heard that it has great support for international text. If Mozilla's support is frustrating you then you might want to checkout konqueror. If you are attempting to read Malayalam, Internet Explorer offers the most accurate rendering. Mozilla Firefox, although a highly recommended browser, does not yet offer great support for rendering Malayalam (The chillus are a problem). Firefox redering of Malayalam is currently a little buggy. I dont know whether the Indic fonts are installed by default or not, but similar to Mac OS X you should be able to run Windows setup CD/DVD and add the font package from there. The Devanagari font is called Mangal, the Telugu font is called Gautami, the Bengali font is called Vrinda, the Gujarati font is called Shruti, the Gurumukhi font is called Raavi, the Kannada font is called Tunga, and the Malayalam font is called Kartika (only available from XP-SP2 update). Install ThoolikaTraditionalUnicode Font, rajana font or AnjaliOldLipi. The most likely reason why you cannot see anything on the School Wiki is that you do not have a font that supports the Malayalam Unicode range. If you can see some letters, but there are too many errors, you probably have a font with poor support for Malayalam Unicode. Perhaps the best fonts available are rachana by K.H.Hussain Anjali Oldlipi by kevin ThoolikaTraditional Unicode font. They work almost perfectly in Windows 95/98, ME, 2000, and XP (especially with Internet Explorer 5 or over). Please download the fonts by following the above links and install them. To install, copy the fonts, open "Fonts" from Control Panel and paste the fonts in the Fonts directory. Default Karthika font available in windows for Malayalam is not able to handle Atomic Chillu Characters defined in Unicode 5.1.0. But current version of popular AnjaliOldlipi supports atomic chillus. If you are reluctant to use fonts which are encoded with atomic chillus, and using Firefox, install this firefox extension to convert newly defined Chillaksharams to old fashion. Even though new versions of Linux distributions are working fine with Malayalam; default fonts bundled with them are not supporting Atomic Chillu Characters defined in Unicode 5.1.0. 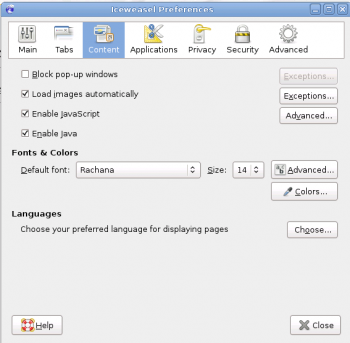 This Modified version of Font Rachana renders newly defined atomic Chillaksharams. You can also use these fonts which has Atomic chillus. If you are reluctant to use fonts which are encoded with atomic chills, use this firefox extension to convert newly defined Chillaksharams to old fashion. ഈ താൾ അവസാനം തിരുത്തപ്പെട്ടത്: 20:47, 26 സെപ്റ്റംബർ 2017.